Commentary: What Trump gets wrong about Mexico - Integration Through Media ....! Mexico has long been a good neighbor to the United States, and in more recent years a good ally – which is why it’s more than a little absurd that a false narrative about our relationship with Mexico contributed to shutting down the federal government last month, and threatened to do so again this week. The two crucial unresolved issues in the partisan brinksmanship of the moment – quarrels over whether to provide permanent relief to the “Dreamer” young immigrants covered by DACA, and whether to fund the building of a border wall – reflect an underlying anxiety about trends in Mexico and along the border. So too, for that matter, does the ongoing renegotiation of the NAFTA trade agreement. President Donald Trump is not known for the constancy or coherence of his positions, but sadly, when it comes to Mexico, he has been remarkably clear and consistent in the story he tells about our almost 2,000-mile southern border – and our neighbor on the other side of it. It’s an inaccurate story, but he has clung to it since the day he announced his candidacy back in the summer of 2015, thereby legitimizing it to a large segment of the electorate. It’s a story of a desperately poor neighbor taking advantage of Americans by luring their jobs away, and dumping millions of its people across a chaotic border that Washington has refused to police for decades, until now. Political leaders typically minimize, or rationalize, policy mistakes and resulting problems, but Mexico is a curious case of the exact opposite – a largely positive story, and arguably a major U.S. policy win, portrayed inaccurately as a disaster. The United States first pressed Mexico to become bound to North America by a free trade agreement during the Reagan administration. U.S. motives always transcended the purely commercial: NAFTA would strengthen the rule of law in Mexico, advance that country’s democratization, and provide the United States with a more stable partner on its southern flank. NAFTA has exceeded expectations on all those fronts, especially in democratizing Mexico and setting it on a more stable path of growth, and not at the expense of the U.S. economy. Bilateral trade between the two countries increased more than six-fold since NAFTA went into effect in 1994, and the growing middle class in Mexico has become a massive consumer of American products, buying more from the United States than any country besides Canada. Mexico imports more from the United States than China and the United Kingdom put together. Mexico has changed dramatically in the two decades since NAFTA went into effect, largely in accordance with Washington’s proposed vision. Both Mexico’s conservative National Action Party (PAN) and once hyper-nationalist Institutional Revolutionary Party (PRI) administrations abandoned the country’s traditional anti-American outlook and rhetoric, and compromised former sovereignty concerns to collaborate closely with Washington on everything from national security to energy policy. When I travel in other parts of the world, where borders are truly fraught with tension, people express a wistful jealousy for the cross-border harmony the United States has enjoyed with both Canada and Mexico. Mexicans and Canadians don’t harbor zealous anti-U.S. designs. When they do cross our border, it’s out of admiration and a desire to advance themselves while contributing to the American economy and society. Our southern border, contrary to what Trump and many of his supporters appear to believe, is hardly an out-of-control security threat to the United States. Billions of taxpayer dollars have been spent in the past two decades hardening security; unauthorized crossings and the number of undocumented immigrants from Mexico are declining. Studies estimate there has been a net emigration back to Mexico in recent years, and demographic trends in that country add to worries of potential labor shortages in our economy over the long run. What’s more, cities near the border, including El Paso and San Diego, consistently rank among the safest in the country. Seemingly everyone in Washington has, at various points, expressed a willingness to provide relief to the “Dreamers,” but the question remains at what cost, and in combination with what security measures. And sadly, these deliberations all rely on a false impression of what’s actually happening in Mexico, and along the border. Not surprisingly, Mexicans are not amused by this lack of appreciation from the United States. 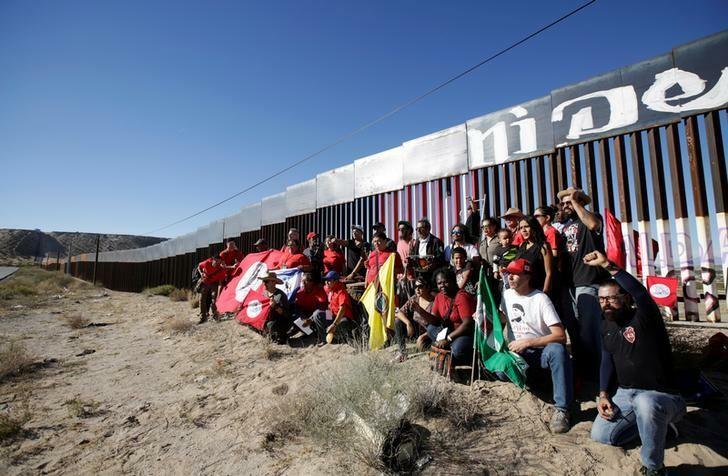 Mexicans’ generation-long effort to set aside historical grievances and apprehensions to open their economy to the outside world, and to U.S. investment, and become a closer partner to Washington, has been met with insulting stereotypes, accusations of bad faith, and demands to pay for a wall to keep Mexicans out. The result has been a sharp U-turn in what had been a steady decline in anti-Americanism in Mexico. According to a survey conducted by the Chicago Council on Global Affairs and the polling firm of Buendia and Laredo, two-thirds of Mexicans now hold an unfavorable view of the United States. The immediate beneficiary of this shift in Mexican public opinion is Andrés Manuel López Obrador, the leftist presidential candidate. The former mayor of Mexico City is the current frontrunner in advance of the July election, and his third run for the nation’s highest office amounts to an “I told you so” victory lap. As in, I told you what befriending the Americans, and kowtowing to the “Washington consensus,” would bring Mexico. The campaign is in its early stages, and López Obrador – “AMLO” as he is always referred to in Mexican media – has reined in some of his more extreme past rhetoric in an effort to reassure middle class voters that he is not another Hugo Chávez, or a Russian stooge. It’s not entirely clear how radical AMLO would prove to be in office – debating the point is a favorite pastime in Mexican cafés and corporate boardrooms these days. But there is no question that his election would prove a dramatic break from the quarter-century consensus across Mexican political forces that an ever-closer relationship with the United States is desirable. And that would be a shame, forced in part by Washington’s flawed narrative of the bilateral relationship, which is poisoning politics in both countries.